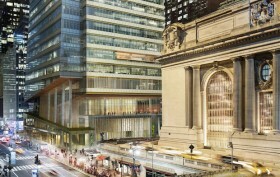 The New York City Landmarks Preservation Commission held a hearing today on a proposal by S.L. 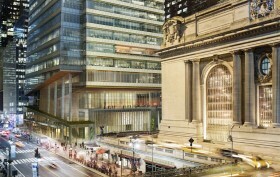 Green to build a huge tower on the northwest corner of Vanderbilt Avenue and 42nd Street directly across from Grand Central Terminal. The proposal before the commission was an application for a “certificate of appropriateness” for a transfer of air rights from the former Bowery Savings Bank Building at 110 East 42nd Street between Park and Lexington Avenues. The developers of S.L. 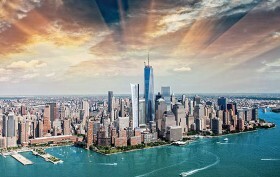 Green made their moves by wooing Landmarks with renderings of Kohn Pedersen Fox-designed tower which would be 1,350 feet tall not counting a 100-foot-high spire—this is significantly higher than the Chrysler Building on the northeast corner of Lexington Avenue and 42nd Street and higher than all the supertalls in construction or planned for 57th Street. Demolition permits have been filed with the Department of Buildings for the tallest condominium building south of ‘Billionaires’ Row.’ The approximately 950-foot tower revealed by real-estate blogger YIMBY last month will house 129 condos within a dramatic champagne flute-like design by the architects Kohn Pedersen Fox Associates. Tentatively named 101 TriBeCa, the uppermost floorplates increase in size to take greater advantage of views uptown and towards the river that most likely will remain unobstructed years to come due to restrictive zoning in TriBeCa and Battery Park City. If you didn’t like the renderings revealed earlier this year for the much-anticipated tower at 101 Murray Street, you’ll be pleasantly surprised to know that they were incorrect. 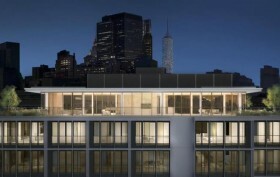 New renderings – the right renderings- have been released to New York YIMBY… and she’s a beauty. 101 Tribeca, as she’ll be called, is being developed by Fisher Brothers and The Witkoff Group, and designed by Kohn Pederson Fox. The building is set to soar over Tribeca at roughly 950 feet tall with a sleek, slender design that elegantly bevels out at the top. The 63-story structure will house 129 condominiums, totaling 433,800 square feet. Its tall ceilings, coupled with its sheer height, promises to deliver unobstructed views that will stretch as far as New Jersey and Long Island. An empty corner lot in one of the most sought after neighborhoods in the city? Now that doesn’t come along every day. When presented with this rare blank slate in 2012, the architects at Kohn Pederson Fox went to work creating an elegant, contemporary building that blends seamlessly with its SoHo-Cast Iron Historic District environs. The result: a luxurious, window-filled residential condominium at 27 Wooster Street in Soho, complete with Thomas Juul-Hansen-designed interiors, a host of upscale amenities, and — wait for it — parking.